Edwin Harry Arkinstall was born in Wolverhampton in 1896. Together with Cyril Adey, he went to Tettenhall Church School. In the 1901 census, Edwin appears with his family at 213 Limes Road, Tettenhall. The household includes his parents, Edwin Henry and Eliza Arkinstall, his 2-year-old brother Thomas Sydney and 9 month-old sister Doris Evelyn, along with his grandmother, Emma Arkinstall. Employed as a cleaner at the Stafford Road works, Edwin joined the local Territorial Force together with Adey in June 1914 at the Drill Hall in Wolverhampton. They went to France with their the 6th Battalion of the South Staffordshire Regiment in June 1915, and both men were killed on 13 October the same year. According to the article that appeared in the Express & Star, Edwin’s address by this time was 58 Limes Road. He is commemorated at the Loos Memorial in France, as well as on the St Michael and All Angels War memorial in Tettenhall. 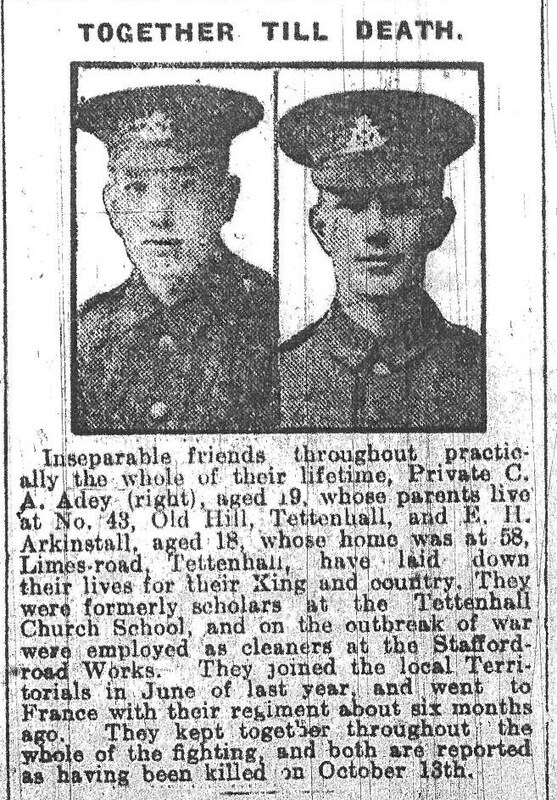 The article in the Express & Star, dated 18 December 1915, is headed “Together Till Death”, and tells the tale of two friends “throughout practically the whole of their lifetime”, Private C. A. Adey and E. H. Arkinstall, who were killed in action on 13 October 1915. They had both attended Tettenhall Church School and then worked as cleaners at the Stafford Road Works, before joining the local Territorials and going to France. Cyril Archibald Adey was born in Tettenhall on 2 February 1896. On the 1901 census at the age of 5, he is living at 41 Upper Street, Tettenhall, with his parents Edwin and Annie and 5 siblings: Edwin John Adey, Thomas Frederick, Mary Jane, Elsie Laura and Ethy Harriett. His father Edwin is a gardener born in Enville. In 1911 the census shows he is living at 43 Old Hill, Tettenhall and age 15, working as a grocer’s errand boy. His father, age 61 is a corporation labourer. His name appears in two UK Railway Employment Records, where he is shown as working in Oxley for the Great Western Railway. His date of birth is recorded as 14 Nov 1895. He was an engine cleaner, in the Locomotive and Carriage Department. He started work there 19 August 1913 with a rate of pay of 2/4 per hour. On the second record, there is a red line through his name and “Killed in action” is written in red ink under the final column, with a red question name under the date column. 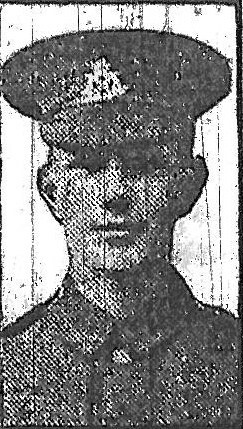 He enlisted in the 6th South Staffordshire Regiment in June 1914 at the Drill Hall in Wolverhampton, arriving in France in March 1915. He was killed during the Assault on the Hohenzollern Redoubt on 13 October, 1915. Adey’s name is listed on the War Memorial at St Michael and All Angels Church in Tettenhall.